Yesterday I was walking Finn through the alley, and saw a tiny glimpse of purple. 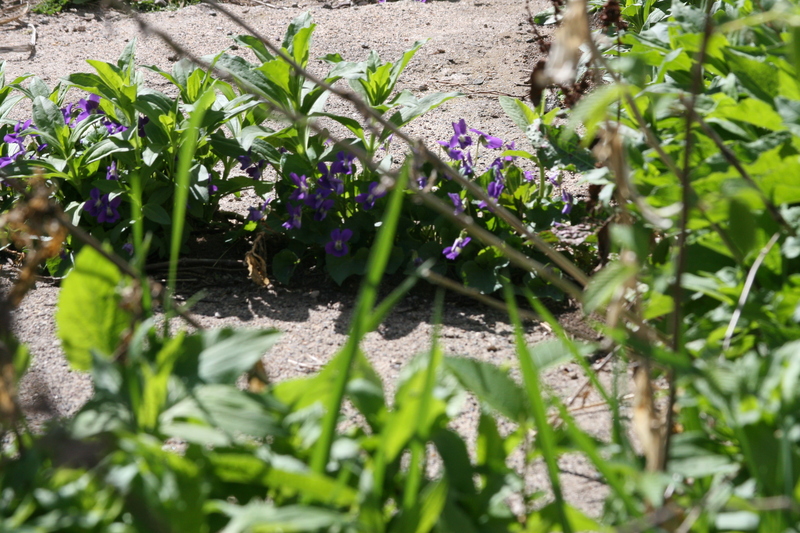 A little scrubby patch of violets growing in cracks of the concrete next to my neighbor’s garage. I get sloppily sentimental when I see violets. Why? Because I know that right now, the front yard of my mom’s house in Wisconsin is completely & unabashedly awash in them. Her entire front yard is a veritable sea of purple, and I’m missing it. Violets will forever put a smile on my face, even if I’m eight hours away from that pretty purple lawn. To ease my yearning, here’s an random assemblage of violet-colored pretties. 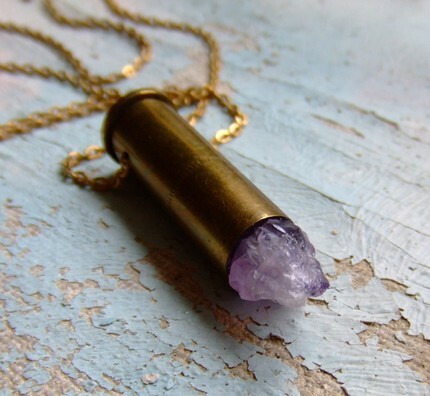 Isn’t this handmade amethyst & bullet (!!) necklace super cool? I want one of Dinosaur Toes’ creations BAD. I love V-neck dresses, and especially heart the flattering cut and comfy cap sleeves on this one. Fact: Sally Jane Vintage has the best finds. I really need to get some violet nail polish. Like yesterday. Or opt for this reasonably priced ($35), but also totally adorable one, also by ban.do. Blake Lively looks lovely swimming in violet ruffles. 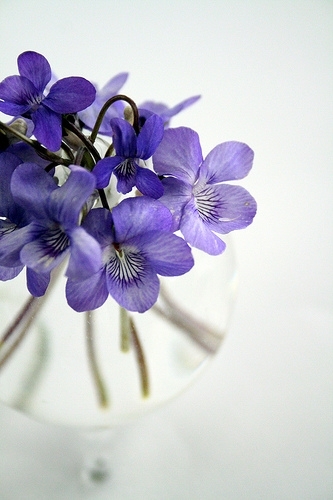 These violet centerpieces are so sweet. Yet another great design*sponge tutorial, found here. A unexpectedly harsh “roses are red” verse. Burn! Geez, four hits on the drum, and I’m already rocking. Q. Is there anyone cooler than Jimi? A. Of course not sillies, we’re talking about Jimi Hendrix! Nails, Blake, poem & violet images all found here. Well, I’ve got nachos to make and Etsy-bound threads to measure. Happy Thursday! P.S. Here’s a silly snap of me trying to work the self-timer of my new camera. While sitting at a stoplight. Someday I’ll learn how to work the damn thing. Just not today, and definitely not while driving. This entry was posted in Uncategorized and tagged music, spring, vintage by highplainsthrifter. Bookmark the permalink. Just found your blog, I’m from St. Paul originally (although I go to college in DC) so naturally a fellow MN blogger is awesome (even if you are from WI haha). lovely post, full of beautiful images. looking forward to reading more! Cuuute blog! I absolutely love all of these violet photos! I really really love that color nail polish. I can never find cute colors like that! love you, darling. you’ll figure out the cam (or you have by now seeing as though i’m a tad late on commenting), but in the mean time i surely hope you’ll snap more lovely pics similar to the silly one above.